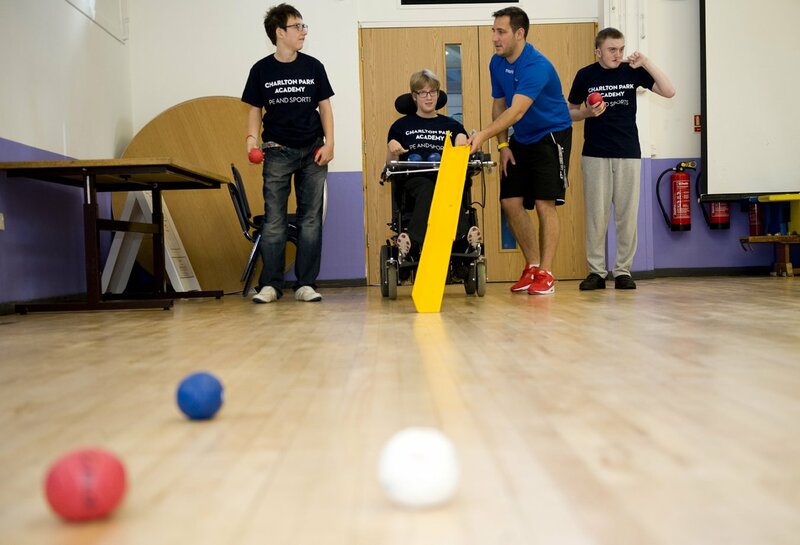 A precision ball sport similar to bowls or curling; Boccia was designed for players with cerebral palsy but also welcomes any athletes with severe disabilities which affect their motor skills. There are around 350 ranked players around the world. Boccia is contested in individual competitions or between teams of two or three. The aim of the game is to get one of your balls closer to the jack than any of your opponent’s balls. A game is divided into ‘ends’, with the overall winner of the match the first player to win a predetermined number of ends. Each player or team gets six attempts/balls to get closest to the jack and the winner takes that end. There are usually more ends for games involving more players. Players are allowed to move their balls with either their hands or feet, whilst they are also permitted to use a supportive ramp should their disability be extremely severe. The sport is one of only two, along with Goalball, which has no Olympic equivalent. It is currently practised by more than 50 countries around the world. Boccia was first introduced into the Paralympics in 1984. No one country has dominated the sport, with Portugal currently the most successful having won a total of 25 medals, six more than South Korea and Spain. GB has won 11 medals, including three golds. Events are held across multiple disciplines, from C1 to C4, with C1 involving those athletes with the most severe disabilities. All Boccia events since the 1988 Games have included mixed teams of men and women. Nigel Murray – the Brit has four Paralympic medals to his name. He won individual gold in Sydney in 2000, followed by team gold in Beijing in 2008. He won individual silver in China, before completing his Paralympic collection with a team bronze in London in 2012. Murray also has four World Championship medals, including two golds. David Smith – one of the most decorated Boccia athletes, Smith has won 21 medals across Paralympic, World and European competitions. He won individual gold in Rio in 2016, going one better than in London where he won silver in the same event. He was part of same 2008 gold medal and 2012 bronze medal winning teams as Murray. Boccia England – please click here for more information. In order for a competition to be considered part of a School Games provision, it must follow a School Games format. All School Games registered users have access to our sport formats and can access the formats for this sport by clicking the button below. Alternatively, you can download the full Boccia format pack by clicking here.